Learning Management Solutions address the learning needs and training delivery & tracking - in businesses and educational institutions - leveraging the advances in technologies. Trans-Domain has been in business since 2002 successfully developing and delivering software solutions globally. The principals of the company have several decades of experience in the global arena having worked in organizations such as Electronics Corporation of India, University of Alabama at Birmingham (UAB), Nortel Networks, Arris Interactive, BellSouth and Teamscape (acquired by Peoplesoft, subsequently Oracle). The breadth of experience includes Custom software definition & development, Training content development & Delivery, Marketing & Sales, On-site-off-site project management and off-shore operations. The leadership's commitment to striving for a better world is captured in the vision and mission statements and forms the DNA of the company. We at Trans-Domain think of ourselves as your Information Technology (IT) partner seeking success in your growth and prosperity. We zero-in on your needs and requirements through rapid prototyping. IT mentoring to suit your learning style. Our solutions are scalable to match your budget. 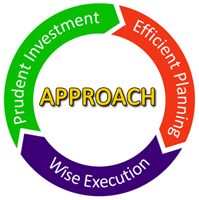 We show you how to leverage IT to execute your growth plans. You will see measurable benefits through our sensible software delivery cycles. We work with you to come-up with flexible payment plans to realize your IT roadmap. Most of all, you can count on our commitment to listening and responding to your IT needs. Our Vision, Mission and Approach statements are founded on the firm belief that our actions should contribute to a harmonious environment both within and outside, expanding to the farthest stretches. They form the DNA of the company guiding us in all our activities. When people collaborate with the greater good at heart, lives are enriched. The outcome is much more than the sum of the individual efforts. An environment that brings out the best in all creates lasting wealth. To enrich the lives of our customers, employees and partners through the magic of collaboration. To create wealth by facilitating the convergence of the best values of all players-customers, employees and partners-transcending boundaries. A work culture promoting collaboration and initiative. Expertise in global collaboration and delivery model. Domain knowledge across various sectors. Interoperability and Integration of systems. Product development life cycle management. Development of robust Software Architecture for scalable and modular functionality. Proficiency in a spectrum of software technologies including Microsoft and Java. Features include role-based access, windows service for complex file and folder processing, custom control incorporating a hierarchical grid with search and auto expansion capability. The portal provided organizations to compare and optimize shipping costs. .Net portal-features include, simplified Air Bill generation, enhanced bill presentation, better reporting formats and dashboard features. Technologies : ASP.NET, C#, Tall components pdf generator, Infragistics UI tool set, webservices. A desktop application to collect county specific property ownership documentation and a web-based workflow management for exception clearing of secondary mortages. Technologies : MS Windows .NET, ASP.NET, C#, Tall Components pdf generator, Bar code solution, Infragisitics UI toolset. Proof-of-concept development of a storage management software product to demonstrate to investors. Prototype played a critical role to successfully raise VC funding. Technologies : Java Technologies, SWING, Eclipse IDE, Design Patterns. Designed and developed a web-based voice transcription workflow platform. Simplified and streamlined transcription work-flow for multiple health care organizations and transcription teams spread across the world. Facilitated cost-optimization for health care organizations to use multiple outsourced transcription vendors. Enabled faster delivery of transcrips. Technologies : ASP.NET, C#, SQL Server. Development of test cases and testing for quality. Provided a collaborative test environment taking advantage of the time differential between US and India. This helped the customer to save time and also to focus on their core capability of development, marketing and sales. Technologies : Java Technologies, Oracle, Perfect Tracker Bug Tracking System. The product offering provides enhanced operational efficiencies with increased revenues and reduced costs to sales organizations of all shapes and sizes. Features include lead and opportunity tracking, organizational hierarchy and privilege based access, interaction capture, product configuration and quotation generation, payment tracking and configurable reports. Technologies: ASP.NET, C#, SQL Server, Entity Framework. An Order processing, Account and Customer Relationship Management system for a Food Delivery Organization was built in record time help the customer meet their aggressive launch plans. Technologies: .NET 4.0, C# 4.0. WPF, SQL Server. An On-line Library system for a leading Law firm to effectively utilize their vast library of books and journals. Technologies: .NET 4.0, C# 4.0. Silverlight, SQL Server. A multi-site, multi-technology media project demanding steep learning curve. The media company had tight roll-out schedules that Trans-Domain successfully supported. Technologies: C, C++, C#, .NET, Visual Studio, SQL Server. Trans-Domain was instrumental in streamlining the software layers in the product improving speed, functionality and scalability. Technologies: Windows based system built with Microsoft Technologies, .NET, C#, Visual Studio, SQL Server, Stored Procedures. Built for a HVAC Parts supplier with multiple stores. Made effective use of Microsoft Technologies to extend the functionality of a legacy system. Technologies: C#, .NET, Visual Studio, SQL Server. A Microsoft Sharepoint based collaboration system was built to track information relating to Ponds needing service, scheduling service personnel, maintaining the data pertaining to Ponds' condition. Upgraded the database from MS Access to MS SQL Server. Technologies: MS Sharepoint 2010, C#, .NET, Visual Studio, SQL Server. The BI system for a leading market research company provides a versatile interface to massive amounts of data, enabling users to slice and dice the information views. Technologies: Silverlight, C#, .NET, SQL Server. Developed a VB.NET Based payment portal integrating with a Payment system in the backend for a leading Medical Facility on the West Coast. Technologies: VB.NET, SQL Server, Payment Systems. Developed in record time an administrator portal for a voice applications hosting service provider. Made extensive use of Java Server Faces for a rich and versatile User Interface. A Business Intelligence (BI) system to analyze and generate reports pertaining to payments by patients to medical facilities. Contributed to Test Case development, fine-tuning of Cube design, Analysis and Report Generation of Collections, Average Payment, Performance, Projections and Alerts. Made extensive use of SQL Server Analysis and Reporting Services. Technologies: C#, .NET, SQL Server Analysis and Reporting Services. Built a privilege-based system for creating and conducting surveys to help identify practice gaps and measure impact of Continuous Medical Education (CME) programs. Technologies: C#, .NET and SQL Server. Engaged by a leading IVR software services company to help them maintain and up-grade their hosted IVR Services software. Made extensive use of DotNetNuke Framework and SQL Server. Technologies: C#. .NET, DotNetNuke and SQL Server. The J2EE based e-commerce framework project included a versatile on-line auctions system. The framework is applicable to any e-commerce business and dramatically reduces the time to customize for any e-business. 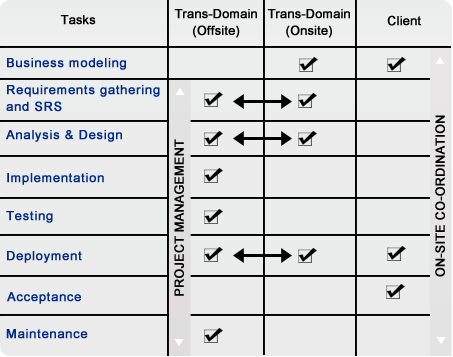 Trans-Domain provided Project Management, Design, Development and Testing services. Technologies: J2EE, JSP, JSF, MySQL, Hibernate. Helped a leading provider of Clinical Trial Management software to upgrade to a newer version of .NET. Also ensured the quality, performance and integrity of the software after the upgrade. An e-commerce web-portal to manage automotive tools products and orders set up and manage affiliates and resellers, attract and retain customers. The portal includes a shopping cart. Designed, developed, tested and delivered the portal in a record time of 6 weeks under tight deadlines. Technologies: C#, .NET, Visual Studio, SQL Server, Stored Procedures. Implemented a web application for a multi-site recruitment organization to manage prospective job seekers for companies. Technologies: C#. .NET, Visual Studio, SQL Server, Stored Procedures. Developed Crystal Reports for a US County to facilitate flexible and active financial planning and budget preparation. Designed and developed a web application to create, assign and execute tests to assess the job readiness of students and prospective employees. Made effective utilization of Microsoft Silverlight technologies for a rich user experience. Technologies: Silverlight, C#, .NET, Visual Studio, SQL Server.